How do you know when it’s time to free your body of accumulated toxins and other waste material? We all like to jump in the shower each morning to feel clean and refreshed. What we don’t often think about, is that it is important for us to keep clean on the inside as well as the outside. To detoxify, is to clean our internal organs from a toxin or pollution. Toxicity occurs in the body when we consume a substance more than we can use or eliminate. From time to time it is beneficial to open our channels of elimination and get rid of all those stored toxins. Exposure to toxins comes from the food we eat, the water we drink and the air we breathe. Chemicals such as pesticides, xenoestrogens as well as stimulants like sugar, caffeine, alcohol, drugs, cigarettes all compromise our body’s natural balance – called homeostasis. Making poor food choices and overeating can cause sluggishness and fatigue. The organs that can become overloaded with toxicity are the liver, gallbladder, kidneys and skin. Cleansing these organs can lead to rejuvenation. Once the body has been cleansed, the immune response will be enhanced. The body will then be better equipped to ward off sickness in the future. People often feel more relaxed, creative, conscious and are able to handle stress better after detoxification as well as experiencing an improvement in digestion, sleep and overall improvement in their health. Is your skin spotty or dull? Are your eyes and hair dull? Do you suffer from flatulence? Do you have abdominal bloating and water retention? Do you have body odor? Do you suffer from mood swings, or anxiety? Do your muscles ache for no apparent reason? Do you suffer from skin problems or eczema? 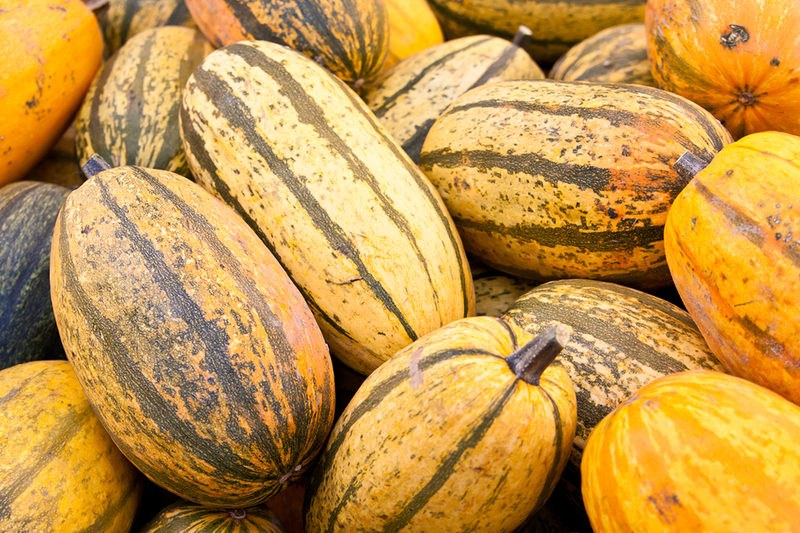 Transfer squash to a large plate, hollow sides up and set aside until cool enough to handle. Using a fork, scrape squash out of rinds and transfer to a large bowl, add butter, parsley, salt and pepper and toss gently. Alternatively, pour tomato sauce on top. Serve immediately, perhaps with a fresh salad or steamed greens with olive oil and garlic. Healthy weight loss doesn’t mean starving yourself. I tell my clients that it’s keeping yourself full of delicious and nutritious food so that you don’t have those crazy out of control cravings for sugar, salt and carbs. When you want that little something it’s sometimes difficult to make the right decision. You’re hungry and tired and just want something yummy. Going for that package of cookies seems like a good idea. It’s very hard these days as you can be easily misled with all the claims on food labels like 0% fat and sugar free. Often times those products have to use strange binders and fillers to make the product taste good and as for sugar free – quite a few health issues are now being linked to artificial sweeteners, especially aspartame. It’s time for a change. The other problem with going for a quick fix or skipping meals altogether is that it throws the delicate hormone balance out of whack. Quick fix snacks, or those that are high in calories and low in nutrition, have a negative effect on the hormone leptin. Leptin controls how full we feel and also once full, it triggers the brain to start metabolizing, or breaking down food. When a lot of poor quality food is consumed there is a tendency to overindulge, which tricks your brain into thinking it needs more and leptin can’t do its job to turn off the appetite. This can result in never feeling full or satisfied which leads to constant overeating and ultimately weight gain. As for skipping meals, the hormone at play here is insulin. Insulin increases the storage of fat in fat cells and prevents the cells from releasing it for energy. When meals are skipped, the body goes into starvation mode and wants to hold onto fat to help with long-term lack of food. This means that if you are constantly skipping meals your brain is tricked into thinking that it should hold onto fat for the duration of the famine. The best way to keep your brain and hormones happy is to feed them a consistent supply of nutrient dense food. This will keep your blood sugar levels steady and insulin levels are less likely to spike. This means snacking twice a day, and about 2 hours after your last meal. 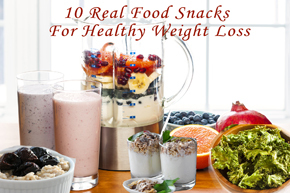 With this list of 10 Real Food Snacks, you will have the tools to navigate snack time with ease. Ideally a snack will incorporate fresh fruit and vegetables, but realistically snack time needs to be either sweet or savory. With a little know how you can combat cravings and soon you will be eating your way to healthy weight loss! Apple & Almond Butter. One of the easiest ways to balance blood sugar is to have a snack that combines fiber and fat with carbohydrates. Apples have pectin, a type of fiber that promotes weight loss by making you feel fuller faster. The natural sugars in apples is balanced by the fat in the almond butter…just be sure to get one that has no extra added sugar. Smoothies. There is a big difference between grabbing a fruit drink vs. making a smoothie to bring to work. Fruit drinks or even fruit juice might be refreshing but they just spike your blood sugar for a short-term energy boost. Smoothies combine the whole fruit, fiber and all, with other add-ins like nuts, veggies and coconut oil. This more complete spectrum will help you feel full longer and satisfies a sweet craving. Granola, Plain Yogurt & Raspberries. An easy snack to put together once the granola is made. Plain yogurt is high in beneficial probiotics – which are vital to good digestion and weight loss. And the vitamin C in raspberries increases the body’s fat burning ability. Stewed Prunes. Prunes aren’t just for old grannies, they are a natural way to stay regular and keep food from getting stagnant in the gut. The fiber in prunes binds with toxins and flushes them out, a key to losing weight. Kale Chips. It is important to check the label on the kale chips, as they are not all created equal. I like Solar Raw Organic “hemp cream & chive” produced and grown in Ontario. They are a lower fat alternative to regular potato chips and by eating them instead of their high fat counterpart a few times a week you can drop up to 7 lbs. a year. Rice Crackers & Avocado. The crunch of a rice cracker and the smoothness of avocado make for a delightful snack. Avocados are considered to be a healthy fat – it has anti-inflammatory properties and helps our digestive tract transport fat molecules. Gluten Free Crackers & Sauerkraut. Sticking with the salty snacks for a moment a nice cracker that is gluten free can do the trick. I like Mary’s Organic Gluten Free Crackers made with sea salt and wheat-free tamari. Sauerkraut might not seem like a snack food to you –yet! It is a natural pro and prebiotic, is high in vitamin C and zingy taboot. Hummus & Carrot Sticks. The crunchiness of the vegetables means that more chewing is required. Not only does this make you feel fuller, it gets the digestive juices flowing and sets you up for optimal energy use. By combining them with hummus, the natural sweetness of the carrot is balanced by the fats from tahini and olive oil. This recipe is all about balancing hormones and feeling great. There are three key ingredients that work together and taste great too: maca powder, cocoa powder and ground flaxseeds. Maca has a way of using cues from the body to balance hormones, this makes it an “adaptogen”. For women, maca is all about improving testosterone and boosting the libido. Cocoa powder, or raw cacao powder if you prefer, is high in magnesium- a great relaxant for both the mind and muscles. Flaxseeds are high in omega 3 (for the brain), fiber (to detoxify) and phytoestrogens (to reduce hot flashes and control belly fat). Place the flaxseeds, tahini and sesame seeds in the bowl of a high-powered blender, such as the Vitamix, and process until well combined. Process until a ball forms. You might have to scrape down the sides. Take the ball out and place on a plate. Roll into smaller 1-inch balls. Tip: Enjoy a couple Maca Choco Flax Balls right away! For those that are left over, store them in the freezer, because once flaxseeds are ground they begin to oxidize and have a tendency to go rancid. Freezing keeps them fresh until you are ready for more. Kind: Almond Cashew with Flax and Omega 3. This bar has about 9 ingredients that are all natural. It does include some sugar but it is non-GMO. Each bars has 190 calories and 11 g of fat. The Omega 3 is derived from the flaxseeds. Larabar: Their Cashew bar has only two ingredients, cashews and dates. It is a very nice way to get something a little sweet with the balance of protein and fat. It has 230 calories per bar and 13 g of fat. Kashi Bar: Even thought they didn’t have a cashew bar, they did have the Honey Almond Flax bar, which I found to be similar in look. The big difference is the amount of ingredients; there are 28! 140 calories and 5 g of fat. This means that even though they are “natural” they have been heavily processed. Try incorporating some of the above healthy snacks into your lifestyle over the next couple of weeks and let me know which are your favourite!